A Guide to Equestrian marketplace. Horseback riding lessons, training, boarding, services, products, all disciplines, all breeds, horses for sale,and event calendars. Guide to molosser breeds, guard dog breeds, bull-and-terrier breeds, bulldog breeds and lesser-known breeds. Descriptions of temperament, history, photographs, and references for each breed. Riders organisation that offers fun shows, trail competitions and riding clinics. Encourages the construction and preservation of equestrian trails, promotes interest in equestrian activities and support equestrian legislation. Message boards for all breeds and equestrian matters. Includes sales list, photos, and profiles of horses. Also breeds Freisians and Miniature Donkeys. Offers boarding, lessons, and training. Located in Arundel, Maine. Held in March at the Middle Tennessee Livestock Center in Murfreesboro. Showcasing various breeds and equestrian disciplines. Calendar of events, visitor information, exhibits, shows, trainers and clinics. Annual horse exposition at CalExpo in Sacramento, California offering equine and equestrian demonstrations, exhibits of horse breeds, lectures, talks, products, and art. Tickets and information. Served as the site for the 1996 Olympic Games equestrian events. Offers a world-class venue for all equestrian events, breed shows, and competitions. Provides a map of the park, information on equestrian facilities, stadiums, and rider accommodations. Has a breeders directory, rare breeds list, and classified area, also information on rare breeds meets. Providing a directory and keyword search for Australian equestrian sites. Directory of equine and equestrian businesses, and events calendar, in western Massachusetts. California equestrian artist specializing in traditional equestrian sporting art and portraiture. Coverage of university riding and equestrian organizations, including results, stories and archives. A moderated portal to equestrian sites, predominantly the UK. Equestrian trade school preparing students for a career in the horse industry. Equestrian holidays based near Seville, combining trail riding with daily training sessions. Magazine for the equestrian enthusiast: Photographs, current events, listings of equestrian professionals. Database about the equine industry and equestrian sports, including shows, events, clincs, breeders, and rides. International Equestrian News Network covering dressage, show jumping and eventing. Requires subscription for worthwhile access. Equestrian hikes in the South West Of France, including the Black Perigord, Great Wines of Bordeaux, The Basque country. A national association of horse owners, trainers, stables, and equestrian related businesses offering group equine insurance. Equestrian facility located in Northumberland County offering boarding, training and instruction in Dressage, Hunt Seat and Western. Open to all breeds of dogs. They register over 300 breeds of dogs and breeds unrecognized by other kennel clubs. You can register your dog or kennel online. Located in West Cornwall. Also breeds Siamese and Serengeti cats. Brief description of the breeds and photographs. Fully equipped equestrian facility with advanced riding lessons and training. Also features clinics and hosts international competitions. Photos, information, and location map. Article that reviews the genetic origin of the breeds and the consequences of selection over time. Riding school, equestrian club and stud with an overview of facilities, lessons and horses. Also provides information about the show jumper Peik Andersin. Located in Espoo. Breeds and shows Chihuahuas and Yorkshire Terriers. Provides pictures, history of breeds, links, and a guest book. An alphabetic listing of dog breeds, strains, and crossbreeds with information and pictures on some of these breeds. Also, a message board and chatroom. If the business hours of Vista Ridge Farm in may vary on holidays like Valentine’s Day, Washington’s Birthday, St. Patrick’s Day, Easter, Easter eve and Mother’s day. We display standard opening hours and price ranges in our profile site. We recommend to check out foals.com/ for further information. 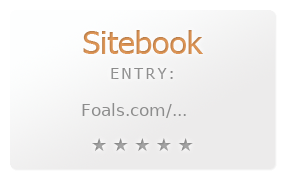 You can also search for Alternatives for foals.com/ on our Review Site Sitebook.org All trademarks are the property of their respective owners. If we should delete this entry, please send us a short E-Mail.